Two common tendencies in digital marketing are, with out doubt, SEO and Content Marketing. Content marketing primarily aims to generate leads, i.e. convert anonymous visits into people with "names" or at least an email address you can contact. However, without traffic it is difficult to convert leads because you will have nothing to convert. You could say that the visits are the backbone and that failure to have them, even though as your conversion ratio is high or your loyalty program is excellent, this will eventually collapse. It would be similar to having a great shop where you buy worldwide, but located in a place that nobody passes. If nobody sees you, nobody can "buy". The biggest source of global web traffic is Google, no doubt. Therefore, if we want traffic than we will have to try to climb up positions and position ourselves or we will be throwing away a vital source of traffic. Furthermore, the average Internet user understands that a result on the first page of Google is a quality result. Therefore, your page appearing there will be a kind of initial validation that will make this person have a positive first impression, then we endorse the content on our own website. Perhaps the only complaint one can make of this kind of traffic is that it is less faithful. Many of the people who enter your site through Google results tend to leave once they have read what they were looking for, but that's where a good strategy should work to uptake leads to ensure that that does not happen. 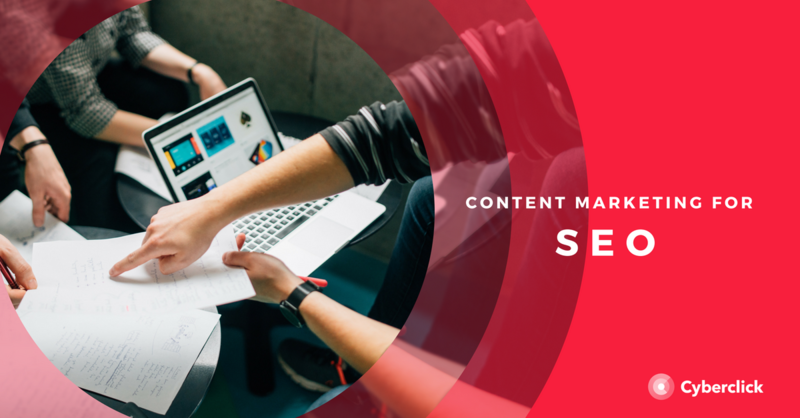 How you can succeed in content marketing SEO? 1. Multiply the web traffic: it is evident that the first benefit of SEO for Inbound is the multiplication of web traffic. A good job of positioning can make a website that received 100-150 visitors a day jump to more than 1,000 in a small period of time. 2. Discover the trends in your industry: if you want to convert traffic into leads, your business must be current and not say that others have been saying that for months. A SEO is able to identify trends and emerging doubts over time by analyzing keywords and searches. 3. Organize the website in a perfect and traceable way: poor organization of the web makes the navigation difficult for the user and can cause them to go back to where they came from. The SEO helps organize the web in a clear and clean way where everything unnecessary is left out and only what matters remains and should be tracked by Google. 4. Helping to shape the editorial calendar: content creation is key to the Inbound Marketing and sometimes it may be more or less difficult to choose topics to write about. Thanks to keyword analysis and trends I mentioned earlier, an SEO can help you nurture your editorial calendar of topics that are fashionable and therefore generate more interaction and satisfaction in your audience. 5. To avoid possible penalties and judgments on the web: if you provoke the "wrath" of Google, the solution of Mountain View is to make you disappear from the results of your search engine or send you to a page that does not even reach the person. Sometimes unknowingly we commit all kinds of Google errors, but having a SEO in the team keeps that from happening and you can throw all previous work overboard. In short, SEO is a vital discipline within content marketing and if you're not careful it will be losing visitors and visitors that could convert into leads and sales. And nobody wants that to happen, right? Content marketing is, today, one of the most important and effective strategies for successful SEO. Similarly, a strategy based on the content marketing helps to increase brand awareness and boost their image in front of the competition. For this reason, more and more companies are beginning to implement such strategies to improve its SEO positioning. Be sure to give more visibility to your content: It seems obvious but not all companies manage their content to be visible in the face of the audience. Achieving good visibility of your content is key for it to have a better SEO positioning. In this regard, it is important to share and distribute the entire contents of your brand through different channels. To do this, we recommend that your company has profiles on all social networks with the aim of increasing the visibility of the content that you share on them. Use attractive titles and descriptions: Another basic SEO tip is to optimize marketing based on the content is to use descriptive and catchy titles specified for the audience. In addition, Meta descriptions should be filled in for each of the contents that we generate. This description should be a brief summary of what is in the text in question. Search engines such as Google, are very sensitive to this kind of description and show it in their results. Therefore, it is an excellent tool to show the reader a touch of what is to be found inside the content. Similarly, it will also attempt to call attention so that the audience clicks our content. Choose the 'keywords' well: The keywords are essential for search engines like Google so that your content stands out over others. For this reason, choosing the right keywords is one of the necessary functions of an SEO strategy to achieve content marketing goals. Tools like Google Adwords will help you to select keywords with the highest search volume and relevance, according to the subject or audience that is targeted for your content. Have you included guest blogging in your content marketing strategy? Although we may at time overlook this techniques, publishing articles as guest authors is a fantastic way to improve your SEO and boost your influence in your industry. Keep reading to find out all it can do for your brand! If you want to improve your brand awareness and perception among your consumers, there is no better way than to surround yourself with experts. Authority and knowledge generate trust, especially if you are targeting millennials, a generation that tends to be rather skeptical towards more traditional forms of marketing. So how can you get the members of your team to show their expertise? That’s right: by publishing on the best blogs in your industry. Guest Blogging is one of the best ways to position yourself as an expert, especially if your articles are shown on influential and popular blogs. If, on top of it, you are able to get your article as a guest author on the top results for keywords related to your industry, you will attract and influence countless users. That being said, prepare yourself for hard work: just as in any other digital marketing sector, there is high competition when it comes to using this technique. You will not only have to show your expertise, but show it in a high quality and useful way. Improvements in your SEO are a marvelous “side effect” of guest blogging strategies. If you are up to date with the latest SEO trends, you will surely know that search engine algorithms are in constant evolution and as they change, so do the guidelines we follow to improve our positions. As search engines become more and more sophisticated, organic and natural positioning becomes much more successful and prominent than filling a post to the brim with a given keyword. What’s more, results are becoming much more personal, adapting for each individual user. As you most likely already know, posting as a guest blogger on a third party blog generates a direct link from their website to yours, making it a vital part of any search engine optimization strategy. One of any content marketing strategy’s goals is to reach out to as large an audience as possible, who, of course, fit the criteria we have defined when creating our buyer persona. Thanks to guest posts, you can reach out to an audience that goes beyond your own readers. If your publish in the right places, belonging to the right influencers, your brand’s messages can go so much further. For this strategy to work however, it is key to choose the right bloggers. Not only do you need them to have lots of readers, but also that these readers be the right audience for your brand. If you take some time to run some market studies on your industry’s influencers, you are bound to find the right people to increase your posts’ audience. You job now is to make sure you create content your followers will find useful, fun and inspiring. Last but most certainly not least, one of the best benefits of guest posting is that it is an excellent way to do some quality networking… and any business needs to network. Whether you are a small local business or a global ecommerce, creating a community is essential for your company to grow and prosper. When getting in touch with a colleague or an influencer to publish on their blog, you are showing them that they have earned your professional respect and are growing your contact network. To make the most off all the networking opportunities offered by invited blogging, program updates into your social media accounts thanking them for the invitation on the day your article is published. This way, not only will you be showing your appreciation and manners, but you will also be returning the favor by showing them off to your audience. Another option is, of course, to open your blog up for collaborations as well. If you nurture and care for these relationships with other blogs over time, you will build up a contact network from which very interesting and valuable opportunities for your brand can show up. If you want to know more, I would like to recommend reading 6 captivating pieces of data about Content Marketing!